Today, the United Nations enters a new chapter in its military history. It will discuss a new Security Council resolution that seeks authorisation for a mission to bomb boats used by human traffickers and smugglers in the Libyan waters of the Mediterranean. If it passes, which it likely will, overnight, militarism will be sanctioned as the default policy response to unwanted migration to Europe. The proposed military mission would be led by Italy and involve some 10 EU states including Britain, France and Spain. The resolution has been drawn up by Britain in response to unprecedented refugee flows from the North of Africa which have been coupled with a huge death toll due to the curtailing of search and rescue operations. There is no denying that some kind of action is necessary to save lives: the stretch of water long known as Europe’s graveyard has become a bleeding blot on our conscience in recent months, with over 1,600 deaths alone this year. Rather than learning the lessons of recent history, and of heading calls from organisations such as Save the Children to fully and systematically ‘restart the rescue’, however, EU member states have opted for militarism as their primary solution to the ‘migrant crisis’. In their recent analysis of the EU plan for action, lawyers Mariagiulia Giuffre and Cathryn Costello conclude that acknowledgement of responsibility is nowhere to be seen. The mass influx of refugees from conflict-ridden countries is nothing new, as is all too familiar to the developing countries in the global south that continue to host 86% of the world’s refugees. But Britain seems genuinely perplexed that its botched ‘military intervention light’ in Libya would result in anything other than stability. At the centenary conference of the Women’s International league for Peace and Freedom in The Hague, I spoke to Zahra’ Langhi, co-founder and director of the Libyan Women’s Platform for Peace about alternatives to militarism and pathways to stability to Libya. Jennifer Allsopp: Zahra’, as a peace activist inside Libya, what’s your perspective on Europe’s response to the ‘migrant crisis’? Zahra’ Langhi: It’s simple. They want to stop immigration, and as always, the approach of the international community is militaristic. But securing the borders is not militarising the borders, it’s quite different. What the international community don’t seem to understand is that it’s one cycle. When you stabilise Libya everything will be better. At the moment a lot of people are not thinking about the human rights of the immigrants because they’re not even thinking of human rights at all. Human rights in a situation like Libya has become a luxury – the primary goal is staying safe and surviving. We know that the trafficking of immigrants comes with the flood of arms, with drugs, all together, and so the answer is not militarising the borders. We need a holistic approach with development plans in areas in the peripheries around the borders. But the problem is that even when the international community says it wants a ‘political solution’, their political solution is not humanitarian, it’s not about dialogue, it’s not thinking of the sustainability of their approach, not thinking holistically. We need a feminist approach, an inclusive approach to the crisis, not just the ‘migrant crisis’, but the crisis of instability in Libya as a whole. It all comes together: immigration, terrorism, trafficking, gender-based violence. They need to understand that it comes together. Now they will take a stand on the smuggling and they will not address the other issues. And that’s the problem. 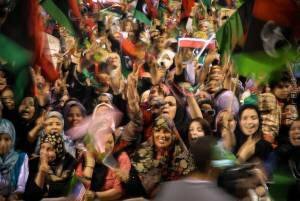 JA: What would a feminist response to the instability in Libya look like? ZL: We believe in nonviolent resistance and in countering violent extremism with development, education, and with addressing the issue from the standpoint of human security. And this requires a strong guarantee from the international community to reconstruct our cities. Because if you come home and find your home is destroyed, anyone can join a militant group. So if we don’t address these issues, we will be failing people. All of the ingredients are there, and we’re waiting to be heard. We’ve drafted a 14 point crisis strategy which we presented to the UN Commission on the Status of Women that links everything together. We worked with Libyan ex-pats, Libyan community leaders on the ground, women and young men, they came from Benghazi, from Tripoli, and we developed the first plan of its kind. The plan isn’t idealistic, it’s rooted in our experience. It says we need to challenge the whole framework of peace building. It’s about bringing an alternative, sustainable, inclusive peace. Peace is at the centre of our thinking, but we recognise that you can’t ignore the people who are shelling us, they need to be stopped. The problem is that, when it comes to arms, there’s a huge hypocrisy in the international community. The international community haven’t wanted to lift the arms embargo because the argument goes that with a lifting of the embargo, arms might go into the hands of the extremist groups. But we keep trying to tell them that they have been going into the hands of extremist groups for over four years now and nothing is being done about it! At the moment everybody, the government, the militias are getting arms but it’s not monitored, it’s not budgeted. If you lift the embargo it will be monitored and we can have a say. It’s happening anyway. This is what we’re trying to tell the UK mission in the UN Security Council. Lift the embargo –with conditions, and I stress this. We want to monitor the budget. At the moment they’re taking from the budget and they’re not paying anything into education and reconstruction and it’s not at all transparent for the people. We don’t want to be another banana republic, another militaristic country. We’re saying, ‘have focus groups and ask us how we want our security sector reformed’. We want it based on human rights, but we want it to be built the way we want it. So we’re not saying we don’t want an army. We want reintegration into the army, but this is a moment for us when we need to have a voice. JA: Can you tell me a bit about the history of the women’s peace movement in Libya? ZL: Salwa Bughaighis was the first woman to come out on the 17th of February 2011 in front of the court to call for a democratic Libya where there is rule of law, where there are human rights, dignity and social justice. Later on she joined the national and transitional council. She resigned in protest because there wasn’t enough representation of women, and we cofounded together the Libyan Women’s Platform for Peace in October 2011, before the killing of Gaddafi. Salwa Bughaighis, National DialogueThe movement was founded to establish inclusive democracy and gender equality, and it’s basically about human rights and gender mainstreaming security sector reform. First we were involved in the electoral process, which resulted in women winning 17.5% in the first election ever in 52 years. Salwa then became the deputy president of the National Dialogue Preparatory Committee. She travelled Libya to call for peace and national dialogue. When we managed to change the roadmap and have another parliamentary election she went back to Benghazi to cast her vote and that vote cost her her life. Ironically, three hours before her assassination I wrote something on Facebook saying democracy without women is a hypocrisy and it’s true. However, democracy with no arms control is a worse hypocrisy. Salwa participated in the democracy, in the democratic process that day. There were clashes, there was no control, no government system. Arms were flooding in, there was no demobilisation, nothing, and so it was meaningless. And so she got killed. And so we had the international community celebrating the completeness of the elections that day, and just one line saying they’re sorry for the brutal assassination of Salwa and so you see they were rejoicing at our bloody democracy. Democracy needs to exist in a safe environment. But it seems that the international community’s intervention in Libya, which was categorised as ‘light model intervention’, was only about regime change, and not building institutions and introducing democracy in a sustainable manner. It was rushed through. JA: And what’s the current profile of the Libyan peace movement? ZL: Many are involved in a peace movement without even realising it. We talk about human security, but you don’t need to introduce this to people, it’s what they want, it’s their priority, it’s about creating safe passages for them, about access to electricity and water; an absence of explosives. There are many internally displaced Libyans, especially in Benghazi, who are really suffering. The city has been completely deserted and left to the militias firstly, and now to ISIS. And so young Libyans feel that the international community deserted them. You need a crisis response strategy or a disaster recovery plan and all the international community is saying about it is calling for a political solution between political factions and not thinking of how to make this peace agreement sustainable. Peace isn’t about NGOs it’s about communities. You can only make it sustainable if you incorporate grass roots actors from the beginning. In peace negotiations civil society is seen as something apolitical, but it’s not, civil society has a political message of dissent. This stereotype of the international community and the UN mission is part of the problem, the fact that the international organisations always like to deal with structured organisations that know how to write proposals, speak English etc. It's a syndrome of ‘NGOanisation’. There needs to be funding for grass roots activists to implement their work on the ground. We’re doing what we can with limited resources. Where there are no schools at the moment women’s movements help with education, or with health problems, but it’s not enough, they need resources. What I worry about is that because these resources have not come the whole population became at the beginning politicised and now they’re more nihilistic and losing faith not only in the process but in human rights. Many activists have fled the country and they are in Tunis, in Cairo, in Istanbul and they are working hard to try and support Libyans inside. JA: You’ve said at this conference that women human rights defenders are the missing link in peace and security. ZL: Yes, exactly. And they need protection to do their work. We cannot operate in a climate of impunity. Part of our campaign is to say that ‘justice for Salwa is justice for all’. We operate under huge risks. We’re calling for two components. Firstly, ending impunity. In the case of Libya it’s the implementation of the resolution 2174, which has not yet been implemented because of the UN Security Council state members. It calls for punishment for warlords who have committed war crimes. And there’s a travel ban, freezing of assets and it ends with the International Criminal Court. As colleagues here have said, we need a comprehensive change in how the international community sees peace making and it needs to include the democratisation of the UN Security Council. It all ties together. This is why we’re keen to build a strong network with our sisters, working under other governments, to make this change. The other part goes hand in hand with ending impunity and ensuring protection for human rights defenders. Because after the assassination of Salwa many people were scared and there was no one to protect them, even when they fled the country. We need more funding and new ways of funding our work. The international community needs us, these people at the grassroots are the agents of change. So much more thought needs to be given to how to protect human rights defenders and how to secure their role in peaceful transitions. I think we need to invest in an international law to give them a status. It’s not enough to say ‘participation of women’. We need recognition. At the moment they only seem to recognise the work of those who take up arms! We need support. Otherwise it’s all a hypocrisy. JA: You are part of peace negotiations hosted by the UN in Algeria. Do you feel your message is being heard? ZL: So far we have had two meetings and for us it was to push for an agenda of human rights and I think a lot of our points were incorporated: impunity, the human rights aspect, however, I am critical of the process as a whole. I think the international community is confused about democracy and about militarism. This is an interesting and unique moment in history when all of us, not just our societies alone, are questioning democracy, democratic tools and we are trying to think out of the box because so far we’ve been seeing failures of the blueprint. They won’t say, hold on, you could have democracy though a process of dialogue. That it could be extended for several months or years and be an inclusive process and give it a real push and a mandate. My problem is that I doubt that the agreement that will come out from this dialogue will work because there’s no clear mandate, and it’s linked with the drafting committee process which is failing in Libya. I wish people would read our plan. Zahra' Langhi spoke to Jennifer at WILPF's Centenary Conference in the Hague on 'Women's Power to Stop War'. Read more interviews and articles from the conference in 50.50's series Women's Power to Stop War.